Virginia "Aunty Virgie" Alexander renowned for her role as pioneer and leader of the dance movement in Saint Lucia died in July. Aunty Virgie trained most of St.Lucia's dance talent over the last four decades with her dance troupe, the Les Enfants Dancers. One of those dancers, not including my temporary stint as a dancer is Tania Isaac. St.Lucian, Tania Isaac is the Artistic Director/Founder of the Tania Isaac Dance company. Tania Isaac Dance is a physically explosive, sensual marriage of modern and Caribbean esthetics: part personal documentary and part social commentary. Contemporary dance with a raga-soca blend of movement ideas, words, and images, the work swings between irreverence and celebration, sensual athleticism and pure emotion, creating a cultural bridge from the dance and music of the eastern Caribbean to contemporary art as a catalyst for civic dialogue. The Tania Isaac Dance, creates projects, performances and residencies that invite audiences into the process of giving a voice to individual experience. 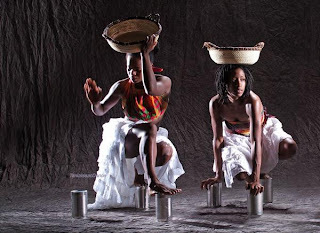 The company has performed at venues throughout the US, UK, Japan and the Caribbean. Tania Issac is a graduate with honors from the University of Wisconsin in Madison and received her Master of Fine Arts from Temple University where she was a University Fellow. Miami Carnival Fetes ... Broward too! One Shoulder, Off Shoulder, Asymmetric! Victoria's Secret Sale & Carnival Sneakers! !